Column #299 Mawson and Part Advance! Today’s Dartoid’s World installment on the second stage round at the Professional Darts Corporations (PDC) sixth annual Las Vegas Desert Classic will be brief but that’s not because of all the e-mails I’ve received begging me to stop churning out this crap or because no North American’s advanced to tomorrow’s quarter finals. No my friends, this column will be short because I’ve just plain run out of nice things to say about Dave ‘Boy’ Green. TWO North Americans (and it should have been THREE) are left standing among the last eight and ironically they are former doubles partners, John Part from Oshawa, Ontario and Gary Mawson, formerly from Canada and now from Cleveland, Ohio. Pennsylvania’s Darin Young, despite leading Dennis “Smiffy” Smith the entire match, landing six maximums, and ending with a nearly six point higher average, saw flurry of missed doubles let Smith steal the contest in the final moments. After Part blasted a 160 finish in his first leg to break Mark “Flash” Dudbridge straight away, Dudbridge responded in kind with a 124 of his own – and that set the standard that kept fans of both players on the edge of their seat throughout. In the end however, it was more a matter of missed doubles by Part (including a bull shot to finish 164) that kept Dudbridge in the encounter that ultimately came down to the tiebreaker. In another tense battle which ended in a score line that belies the closeness and back and forth nature of the match, after being ahead and behind and ahead and behind again to Alan Tabern, down 6-5, Gary Mawson finally found the darts reel off a three-leg string to take the match 8-6 and move to the next challenge of the tournament. 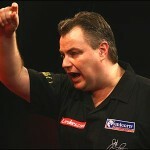 Mawson will face Terry Jenkins in the fourth best-of-nineteen leg quarter final contest tomorrow. Jenkins prevailed 8-7 over Wes Newton today in a barnburner of a match in which neither player seemed to be able to find the double in the final leg. In the end Jenkins stuck the double four to set up his meeting with Mawson. In Part’s quest to defend his title he will step to the quarter final oche against Dennis Smith. Part will be the odds on favorite to head straight to the semis on Sunday. In the third quarter final contest, Adrian “Jackpot” Lewis will see Peter “One Dart” Manley. 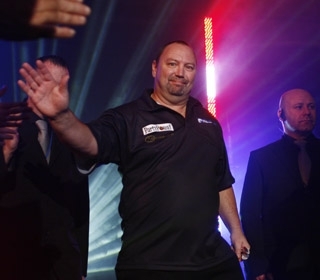 Lewis threw BIG darts today, including finishes of 155, 146, and 124, to see off tough PDC newcomer, Mervyn King 8-6. For his part, Manley was on form and dispatched Colin Osborn 8-4 with relative ease. Tomorrows Lewis-Manley contest could be a great one. Finally, world champion Raymond van Barneveld will take on his countryman Roland Scholten. Barneveld dismantled Wayne Mardle earlier today, taking the dance out of “Hawaii 501’s” step with a blistering 8-1 victory. Scholten rolled past Steve Beaton quite easily as well, ending the match 8-5. The thing is, the world champion averaged just under 100 – and pretty much has all week; Scholten averaged eighty-eight. Averages may not mean everything and tomorrow is another day – but the bookies are surely going to be predicting a manhandling in this quarter final pairing. Play beings in the morning at 11:00 and afterwards comes the semi-final draw – and on Sunday BOTH the semi final and final matches will be played. The finish line is in sight. Eight players now are assured of at least a $10,000 pay day. Tomorrow four players will be guaranteed at least $15,000. And the two players will fight it out in the final best-of-twenty-five leg championship contest to determine how to divide the remaining $60,000. Good luck to all – especially Part and Mawson!